Red Coral represents the Base Chakra, which is related to physical identity and self-preservation. Located at the base of the spine, the Base Chakra forms our foundation and brings health, prosperity and security. We have provided a sound file if you would like to hear this Chimes beautiful sound. 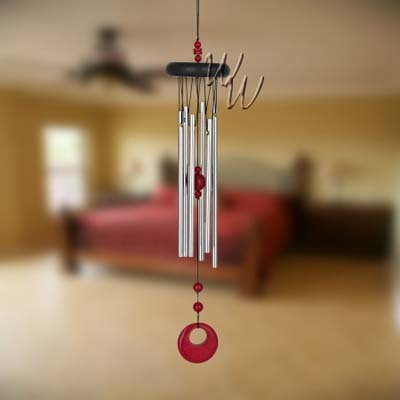 Woodstock Chimes rods are made of aluminum that will not rust when exposed to the elements. However, when hung outdoors, the aluminum may show wear as a result of environmental factors. Please note this will not affect the beautiful tones of your chimes. If necessary, use mild soap and water (or a foaming, non-abrasive cleanser) to clean the rods You can also use very fine #00 steel wool to polish and restore your aluminum rods.